Spring Break Snapshot! 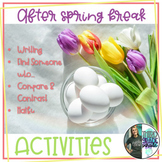 A fun way to get your students to draw and write about their favorite or least favorite parts of Spring Break. Students have space to draw and write about two memories of Spring Break. 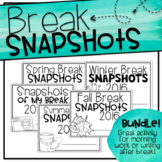 Snapshots of Spring Break is a writing activity for students to do when they return from vacation. Students can write and draw a picture about each day of break or complete their "who, what, where, how and favorite". 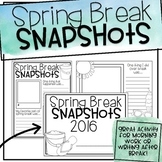 This is a simple and fun way for students to share what they did on their spring break. Students will make a camera shaped book and draw pictures of things they did on break. They can add captions and share with the class. Use this page as a way for students to share with classmates what they did over spring break. 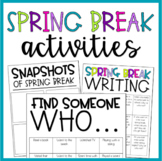 These no prep printable writing pages is a great product that allows your students to share with you about their spring break while still working on writing skills. Students may add a picture or snapshot to their writing as well. Pick the pages that work best for you and students. Enjoy!